Hydroponics is growing plants without soil as the plant media. You probably assume that soil is indispensable for plant growth, but we are about to change your mind. The different functions of soil can be recreated using other materials. Basically, soil provides support for plants because it develops a physical structure for the roots to hold on. In a hydroponic system, the physical support provided by soil can be replicated with a number of materials and structures. The choice of a good hydroponic system is huge in today’s market. However, we have been able to select five top rated products for your selection. There are several hydroponic methods or techniques you can consider. This is the most advanced hydroponic technique on the market. It uses a little amount of growing medium. Therefore, the plant roots hang in the air and are misted with nutrient water. This method is ideal for growing small plants and herbs. Bigger plants are not easily supported by this technique due to the lack of substrate. Usually, the roots are held by a contraption. What’s most impressive about this technique is the fact that it is equipped with a timer that is connected to a pump that automatically mists the roots. Aeroponics systems are remarkably lightweight because they barely use a potting medium. These systems are suitable for small spaces. The aeroponics technique is considered the most advanced, but the deep water culture is the most popular in the current market. Deep water culture systems are usually fitted with plant sites/holes and a reservoir. The roots are supported by a growing medium, such as hydroton clay. It is normally important to use a growing medium that does not retain moisture since the plant roots are constantly submerged in the solution. DWC is probably the easiest system to set up, making it a suitable choice for inexperienced growers. You can even build your own deep water culture unit. This is a simple technique that is popular among growers. It uses a timer that controls a submerged pump. Usually, the pump is connected to small pipes that are dipped to the roots of the plant. Normally, the pipes are fitted with nozzles that are easy to adjust to control the amount of water. The pump is automatically turned on by the timer so as to provide a measured amount of the nutrient rich solution to the plant. With this technique, you are advised to use a soilless mix so as to prevent water from accumulating which can cause the roots to rot. In most cases, drip ring systems use rocks to support the plant. The amount of water required for this method is minimal, making it the most cost-efficient technique. Basically, this is a sub-irrigation technique. 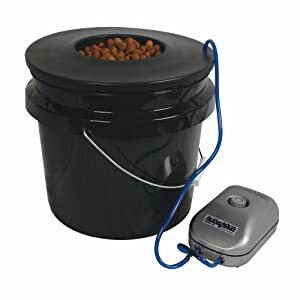 The nutrient solution is pumped into a shallow growing bed to a depth of around an inch for about twenty minutes and allowed to drain back to the tank. 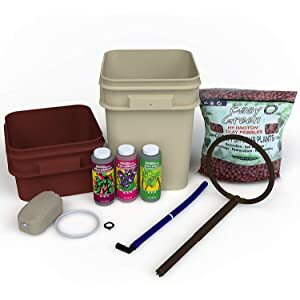 If you are a first time gardener, then this is the ideal choice for you because it is easy to set up. The number of times the pump is switched on depends on the specific plant needs. The ebb and flow technique use a loose growing medium, which can easily get stuck in the pump, causing power outages. Hydroton is made from blends of different clays fired in an open furnace to get rid of heavy metals as well as other contaminants. Hydroton pellets have good water retention and pH sustainability that protects the plants against excess acidity. Some of the top rated hydroponic systems use hydroton, and they normally have few insect problems, but may suffer from green algae. You can use different types of gravel or rocks as your grow medium. This is by far the most economical grow medium. Some of the finest rock materials you can consider include river rock, lava rock, and pea gravel. Rocks are highly aerated. This is a relatively new growing medium made of fibers from the husks of coconuts. Coco coir can vary from one manufacturer to another. Coco coir has good water to air ratio. This medium is capable of holding water for quite a while between watering. It does also have good pH sustainability and slower drainage and drying rate. The only problem is that coco coir is vulnerable to insect infestation. This medium is made from natural rocks that have been melted down and blown into mineral fibers with unparalleled water to air ratio. It has remarkable water retention and its extreme porosity makes it drain well. This medium has superior pH sustainability. Rockwool is available in different sizes, mats, and plugs for propagation. The alkaline nature and porosity of Rockwool make it subject to the aggressive growth of mildews, molds, and algae. The Bubble Boy is a practical and affordable way to grow plants hydroponically. The Bubble Boy system uses what is known as deep water culture (DWC). In DWC systems the roots are suspended in a highly oxygenated, nutrient rich water. This is a perfect choice for a green thumb or a little green. Using high quality hydroponic fertilizers, the roots don’t have to convert nutrients for the plants to use. This allows your plants to grow faster and larger. Aeration is an important feature of a DWC system. That is why the manufacturer has included a large dual outlet air pump along with a high quality air stone. The air pump and the air stone provide better diffusion and increased oxygenation. This combination guarantees the production of healthy plants in a short period of time. The Bubble Boy system is also equipped with a durable black reservoir as well as a factory-pressed lid. The lid helps to protect the plants against algal growth. Are you searching for a classic bucket system with unlimited possibilities? Look no further than the Waterfarm by General Hydroponic. The unique four-sided construction allows you to pack modules closely together in order to create a large as well as high density installations. This growing system is one of a kind. It will grow large, medium, and small plants. Basically, it provides all the characteristics of larger systems at a reasonable cost. The Waterfarm, as a complete unit, is engineered to be a standalone system. It features a classic single plug and plays bucket system. The Waterfarm Hydroponic System utilizes a pump to carry nutrient rich water from the reservoir upwards to a drip ring. The drip ring distributes the solution to the growing chamber. You can add a small piece of air stone into the reservoir in order to improve oxygenation. This helps the plants to grow at a steady pace. SavvyGrow provides you with a unique deep water culture hydroponic system, which allows you to grow plants faster, cleaner, and with no pesticides. 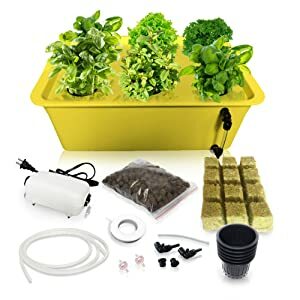 This top rated hydroponic system is perfect for beginners. It is a good starter kit for indoor vegetable growing, and for school projects. This hydroponic system is a sizeable box that measures 16 inches long and 10.8 inches wide. It has 6 plant holes. Each hole is 5.5 inches deep and 2 inches in diameter. The package comes with a sachet of hydroton clay balls, which is the growing media for the plants. There is also an air pump that runs at the bottom of the reservoir. You also get two air stones, which provide lots of air bubbles, providing adequate oxygen for your plants. The reservoir is very sturdy and thick for durability. The unit has a locking lid that ensures the inside of the reservoir is dark and also prevents algal growth. 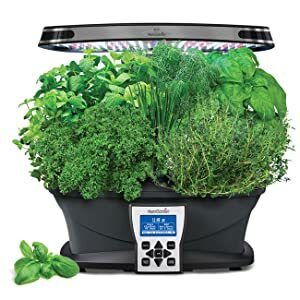 The AeroGarden is a top-of-the-line indoor hydroponic system, which is highly resourceful for growing fresh flowers, salad greens, vegetables, and herbs. The system uses deep water culture to distribute nutrients naturally without the presence of GMO, pesticides, or herbicides. The unit measures 17.25 by 11.25 inches. It is fitted with 7 plant sites. The system has a growing area of 4.5 to 24 inches high. The system comes installed with an LED grow light, which is tuned to a precise spectrum. The spectrum promotes photosynthesis, allowing the plants to grow naturally and rapidly. The LED grow light has red LEDs for bloom, blue LEDs for larger yields, and white LEDs for expedited growth. The AeroGarden comes with a user-friendly control panel with an interactive LCD display. The panel has simple prompts that are super easy to maneuver. The LCD display shows you the number of days the plants are planted when to add nutrients, and the new tip available. Are you looking for an easy and inexpensive way to grow your plant hydroponically? Look no further than the PowerGrow Bubbler. This system distributes nutrients through deep water culture, which is super easy to use. The deep water culture allows for fast growth with little effort. In this system, the roots of the plants are submerged in a nutrient rich and oxygen infused water. The enriched solution promotes faster and healthier plant growth. 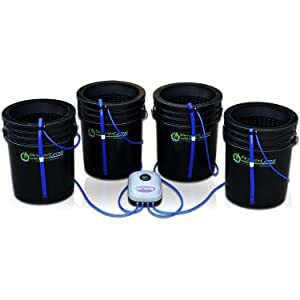 The four identical grow buckets are controlled by a single air pump, which does a great job of managing the four buckets. According to technological advancements, the popularity of hydroponic systems is growing. They are the perfect choice for small areas. These systems offer the potential for faster crop growth. Hydroponics feed roots in a precise blend of important nutrients with a balance of oxygen and water. Hydroponics use less water because you may reuse any irrigation water not directly consumed by the crop. Evaporation can be reduced by covering the water reservoir. With a hydroponic system, no need for weeding or herbicides. Therefore, your plants will never suffer the effects of harmful herbicides.